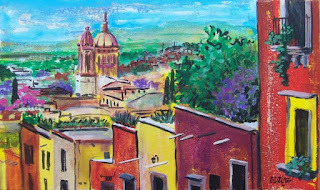 Cristi Fer Art Gallery and Workshops, in San Miguel de Allende, Mexico: Some spaces left in October and November 5 Paintings in 5 Days Workshops at Cristi Fer Art Gallery in San Miguel de Allende! Some spaces left in October and November 5 Paintings in 5 Days Workshops at Cristi Fer Art Gallery in San Miguel de Allende! Cost $650.00 includes all the acrylic painting materials. This two workshops will focus on beginner, intermediate, abstract and self-taught artists. This workshops are for you! The bonus is that we offer painting workshops in San Miguel de Allende, the Heart of Mexico! San Miguel de Allende it’s a favorite destination for many US, Canadian, Australian and Europeans who are looking for a relaxing vacation or a feature retirement nest. This is a great excuse to leave behind the rain and cold and join us in a fun, sunny, charm filled Colonial Mexican town. Contact us ASAP to find out how to register!